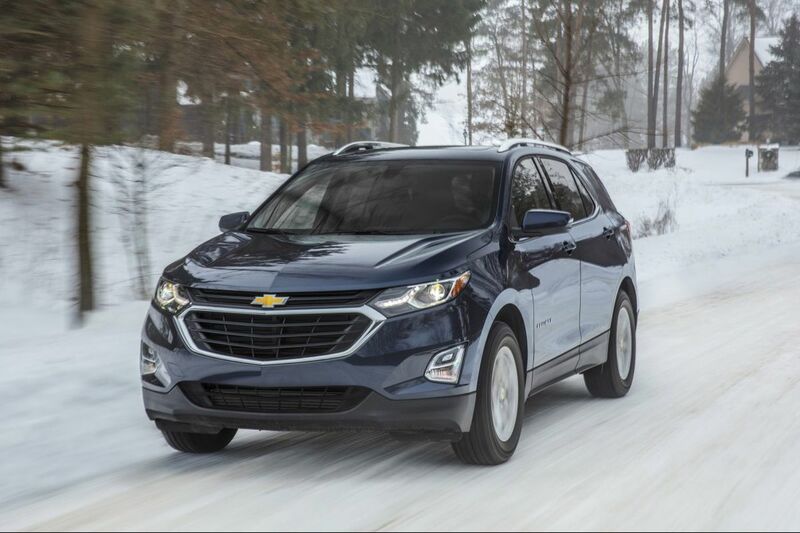 The base model Chevrolet Equinox starts at $23,950. The test car was a front-drive, Premier model that started at $33,585. Chevrolet has sold two million copies of its Equinox crossover since its debut in 2005. That's a lot of cars and seemingly cause to hoist a corporate cold one. But it's also true that the Equinox was fifth in sales in the compact-crossover segment at the dawn of the 2018 model year, a less toastable proposition. Chevrolet obviously wanted to do something about the fact that the Honda CR-V, Toyota RAV4, Nissan Rogue, and Ford Escape were outselling it in the nation's fastest-growing vehicle category. And so, it engendered a completely new, markedly better Equinox for 2018. This new compact is 400 pounds lighter and five inches shorter than the second-generation car it replaces. It is also quieter, better handling, and more fuel efficient than its predecessor. And despite the fact it's smaller (at least one motoring magazine couldn't stop itself from saying, "Honey, I shrunk the Equinox"), clever packaging has kept the cargo and seating areas virtually as roomy as they were before. The all-new car's body is nicely proportioned, albeit less than muscular. The surprisingly roomy interior is somewhat restrained but attractive. The base car starts at $23,580. For that you get a nicely equipped front-driver with a 1.5-liter turbo that develops 170 horsepower and good torque, and a six-speed automatic gearbox. All-wheel-drive tacks $1,750 on the ticket. The larger, torque-rich, 2-liter, 252-horse turbo, which comes with a nine-speed automatic, is a $2,500 option on the cheaper models. (In the case of the test car, a front-drive, top-of-the-line Premier model that started at $33,585, the 2-liter with the nine-speed was standard.) There is also a 1.6-liter diesel, which the Germans call the "whisper diesel." It adds $3,900 to the tariff but also boasts an EPA mileage estimate of 28 city and 38 highway as a front-driver. The FWD car with the base engine gets EPAs of 26 city and 32 highway. The 2-liter front-driver manages 22 and 29. With its new version of the Equinox, Chervolet hopes to become more competitive in the crossover market. Driving the test car proved a very satisfactory experience. The new Equinox's significantly improved torsional rigidity translates into a very solid feel, not to mention the quietude and handling aplomb that solidity enhances. Indeed, handling is one of this car's strong suits. There is little body roll in the corners. The suspension remains composed when pushed hard through a turn. It doesn't feel floaty. The nifty thing about this suspension is the handling/ride compromise its designers negotiated. Perfectly damped, this suspension provides that nice athleticism and a comfortable ride — no small thing. Add to that properly weighted and accurate steering and good brake feel, and you pretty much have the whole dynamic dessert. I haven't driven the Equinox with the less robust base engine, but I can tell you the 2-liter turbo in the tester was pretty gutsy — lively fun, indeed. Visibility proved good both fore and aft. The seats were comfortable, although a little more front-seat bolstering would have been welcome. There was sufficient headroom in the backseat, and plenty of legroom. I was surprised by the amount of hard plastic surfaces I found in the leathery, loaded upmarket tester. While the Equinox starts at a quite affordable price, it can climb hurriedly when you start tacking on the goodies. The already loaded upmarket tester's $33,585 sticker climbed to $40,110 after you added optional additional electronic safety devices and hedonism, and shipping. The Equinox does pretty well on the government safety ratings, getting four out of a maximum five stars. Equinox owners get two maintenance visits that include oil and filter, tire rotation, and a 27-point inspection.